At 6 feet tall and 210 pounds, it’s hard to miss senior outfielder Sean Barksdale on campus. It’s even harder to miss him on the baseball diamond, where he’s putting together one of the most prolific careers the baseball team has ever seen. Hitting .333 with 106 RBIs over the past two seasons, Barksdale has established himself as a force in the middle of the lineup. In just two seasons at Temple, the Glenolden, Pa., native has positioned himself just 49 RBIs and 33 stolen bases away from becoming the Cherry and White’s all-time leader in those categories. Barksdale’s career at Temple, however, almost never happened. An All-Catholic League and All-City football star at Cardinal O’Hara High School in Delaware County, Barksdale’s talents on the gridiron oftentimes overshadowed those of his on the diamond, coach Rob Valli said. Sean Barksdale shags some fly balls during team practice last week at Geasey Field. The senior outfielder needs 49 RBIs and 33 steals to break program records (Nic Lukehart/TTN). Despite the interest from several small football schools, Valli, who was then the coach of Gloucester Community College, saw a potential star baseball player in Barksdale. Barksdale agreed to play baseball for the Roadrunners, and he went on to hit .298 with a team-high 44 RBIs in his freshman year, while leading the team to a runner-up finish in the NJCAA Division III World Series. When Valli received the coaching job at Temple in October 2005, Barksdale’s ambitions shifted toward the Owls. After a successful sophomore season during which he was named first-team All-Atlantic Ten Conference and Big 5 Co-Player of the year, Barksdale entered his junior year with the added pressure of being a legitimate pro prospect. 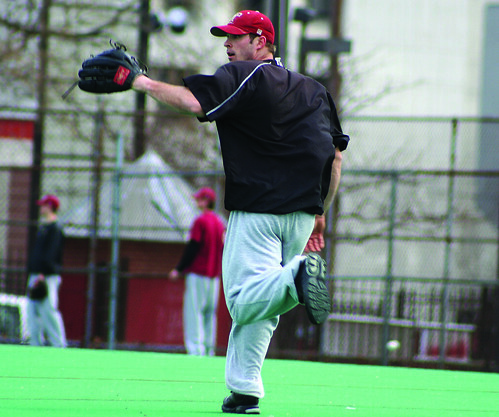 But, he stumbled out of the gate, hitting .228 in the Owls’ first 26 games of the 2008 season. Over the course of the season’s final 30 games, however, Barksdale hit .377 with 30 RBIs, showing the type of offensive prowess that led Baseball America to name him the third best pro prospect in the A-10. While the numbers speak for themselves, Barksdale’s true value to the team goes beyond mere statistics, his teammates said. “He leads by example. That’s how I’ve always looked up to him,” senior catcher Kyle Obal added. That high praise from Barksdale’s teammates compares favorably to what Valli said about him. The Owls’ fourth-year coach said his outfielder is gifted with an abundance of natural athletic ability, yet still doesn’t take anything for granted. It’s this combination of work ethic and talent that leads both Major League Baseball scouts and Valli to predict that Barksdale will likely take his skills to the professional ranks next year. Despite all the talk of the MLB draft and potential Temple records, Barksdale remains focused on one thing. That’s a record the Cherry and White would gladly accept.